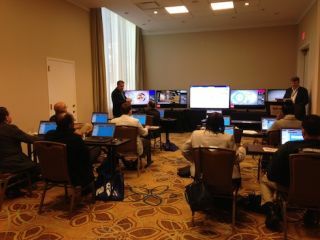 Almo set aside rooms for hands-on training sessions throughout the day during. Four times a year, Almo Professional AV Division creates an opportunity for industry professionals to meet in person to get training on the latest products, and face time with companies within Almo’s circuit. Almo’s New York stop, held on October 8, brought a hands-on environment to the area’s professionals, with training sessions, demos, a show floor, and lectures. And to do that, Almo partners with InfoComm to offer CTS renewal units to attendees through their training sessions. With such a packed schedule, it was difficult for me to catch every session, but I was lucky enough to attend one of Almo’s E4 Experience workshops, learning how to create content using Almo’s online content creation service, and to publish it onto a digital screen using BrightSign’s Bright Author software. For me, this hands-on demo was incredibly helpful to understand the ease of use for these applications. I can write about content creation over and over, but until I am actually in a situation where I can create it myself, I won’t be able to grasp the full idea of what this technology can do. Almo’s content creation service is housed online at contentcreator.almoproav.com, and offers a variety of pre-established templates that allows you to easily drag and drop your images and type up your information onto the sign. For the demo, I created a menu board for my fictional restaurant, and I was pleasantly surprised at how easily I could manipulate the sign to look the way I wanted. I had a similar situation with Bright Author. Using a simple upload, drag and drop system, I was able to create a multi-zone board complete with video, images, live streams, time, and date, and then publish it onto a screen using BrightSign’s connectors. As someone who rarely uses design tools, this application was very intuitive. In a matter of minutes, I had everything assembled and was able to transfer the information over to the display with the touch of a button. Looking at more details to the software, I could schedule each piece of content for certain times and days. Almo was sure to offer plenty of other training sessions throughout the day too, from lectures on HDBasedT installations, to business strategies, to signal distribution, to noise issues in audio installs. The purpose, as Craigmyle pointed out, was to provide free education tools to area professionals. “This event allows attendees to get a feel about how these products work together, and gives them time with the exhibitors for a hands-on experience,” she said.